I love the Silpat and never thought about Ebay. Will check it out because it is on some Xmas lists. Anne, your sables look wonderful! They were a real hit here too. Can't wait to try the lemon version. Would die without my Silpats! I'm a big fan of those tin cookies too! These are cute and I would love to gift them to someone...hmmm...thanks for sharing the recipe! 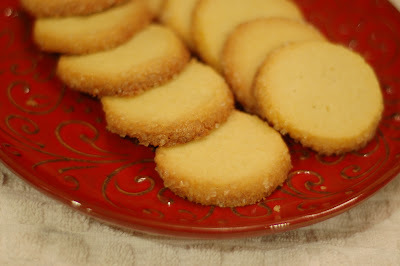 I've never been a big fan of the butter cookies in the tin, but these I loved. Thanks for the info on the Silpat. I've gotta check that out. These were lovely. I need to make mine thicker next time. Beautiful! We enjoyed them too :) I still need to get a silpat! These are just. so. fabulous. They are will be the star of my Christmas. I agree with Pamela ~ love the tin but not so much the cookies. These little cookies were very good! Gorgeous job! Your cookies came out perfectly! These cookies reminded me of those Christmas tins, too, especially when I smelled them. And they really were great little cookies. Yours look beautiful! i want a silpat! i love your photos and your sablés are a perfect golden brown. I keep thinking I need to get a Silpat. I may add it to my Christmas list! Your cookies look fabulous! I love my Silpats, too. Glad you liked these cookies! Definitely a go-to holiday cookie - yours look great! 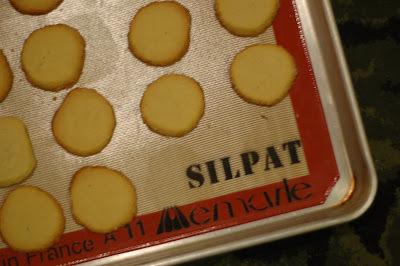 I just bought two silpats last week for my cookie baking blitz. I love them already. And I love these cookies! Cookies look great. I enjoyed these - not real sweet, but very tasty. I love those cookies in the tins also and my husband said these tasted like the ones in the tins too. :) Glad they turned out for you. I was peased as well. Your sables look wonderful. These are my new favorites too. Good tip on Silpat from eBay - I'll remember that! those are my favorite cookies! The blue tin butter ones! You're right, they are perfectly buttery and so simple! I didn't use my Silpat but will next time. I bought mine at William-Sonoma...dumb! Silpat. A baker's best friend! These look great and I agree - the ultimate, easy holiday cookie, or any time of the year. Lemon.... HAVE to try that, have done orange and loved those as well. Beautiful cookies! I love my Silpat. I only have one and use it over and over and over again. I also love sables. Awesome! oh these look so perfect!